We opened our Shreveport location in November of 2012. It was our first venture outside of Arkansas. We love that store, and we love the people of Louisiana, who have their own eclectic style, culture, cuisine and so much more. They have welcomed us with open arms, and we will continue to support our community there, and hopefully, in the future, grow into other communities in the state. Our hearts are broken for the people in Louisiana displaced by the recent flooding, and we cannot imagine their difficulty and devastation. 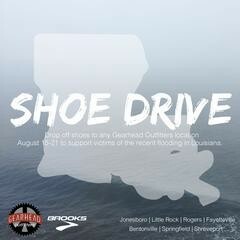 Brooks running and Gearhead Outfitters have partnered together to raise donations of shoes for those displaced. We are collecting at all locations August 25-21. If you would like to make donations of shoes or apparel in good condition, please bring it to your local Gearhead. We will be shipping these items to the most devastated areas of Louisiana to hopefully provide even the smallest of comfort during this time. We appreciate all who have donated so far and thankful for the giving hearts of all of our communities.